NXS issue #3 Viral Bodies investigates the changing concepts of gender and identity norms in the digital space, and opens the discussion to many possible speculations and their real world implications. Kicking off the issue with a piece by Reba Maybury, over 20 fellow contributors subsequently explore social conventions, share intimate moments and experiences of pain, love, hate and fear. They delve into authenticity in the non-human sphere, or code accidental bigotry on the internet. Science fiction writer Alan Dean Foster blurs the lines of reality, transmitting what is real and what not in a dystopian society. Political art critic Penny Rafferty unravels the minds of tech giants while artistic researcher Addie Wagenknecht questions the diffusing lines between virtual technology and working bodies in reality. 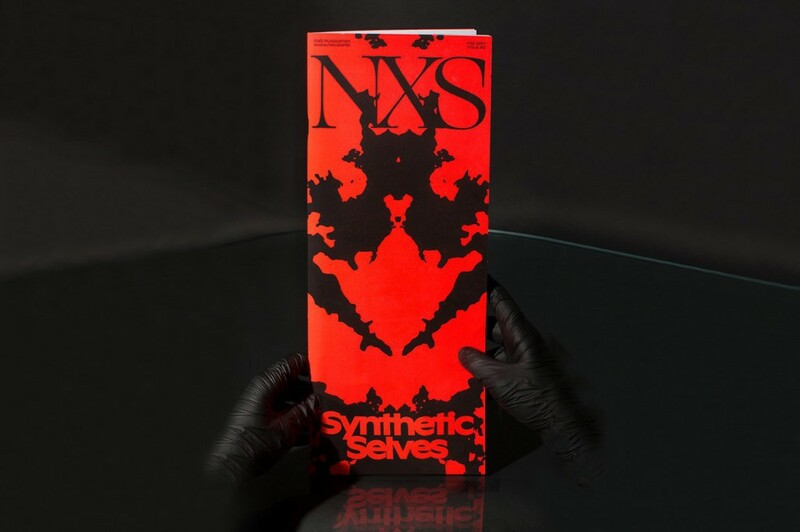 NXS issue #2 Synthetic Selves centres on how the self is understood in the digital era, by investigating whether we have full agency in constructing ourselves and what kind of images of ourselves we are broadcasting. Online environments are playgrounds for our identities and places for becoming the other. At face value, online platforms seem to promise us the opportunity to become anyone we want. Yet what happens online has consequences in the physical world, and, what happens online is supported by the physical systems in which we grow up and live. Technology not only mediates the narratives of our daily lives, it shapes them. NXS Issue #1: Cyber Sensuality aims to explore the emotional and sensual side of hardware, software and algorithms, that normally have been assessed by their functionality, aesthetics and ethics. Dive into NXS Issue #1 and explore our desires through screens, our strolling habits, the multifacet word neon, poetics of nomos, oneiric dimensions, anonymity, narcissism, filters, pixelated mysteries, 3D arousal, the act of ghosting, smelling and touching social medias, tantric worlds, erotics of code, spam appeal, seduction at the time of mobile technologies, the self as a predator, cybernetics and organism, the intimacy with our devices, a feverish Chatroulette interaction, confessions on digital behaviours, speculations on robot’s love life, connections, cybersex, the image of the self, love and empathy, a cyborg identity, love dolls with AI and times of confusion. NXS is a collaborative research project that has been exploring “the self” in the age of digital technology since 2016. NXS – standing for nexus – creates its content by building a network of contributors and their writings or visualisations. Each of them is asked to reflect and comment on a previous contribution. NXS takes the form of a cross-platform structure with exhibitions, performances, lectures and a biannual publication as its core. It searches for personal viewpoints, experiences and stories on relevant topics around digital technology, as a way to make them more tangible and more accessible to an audience that reaches beyond artists, designers, and theorists.